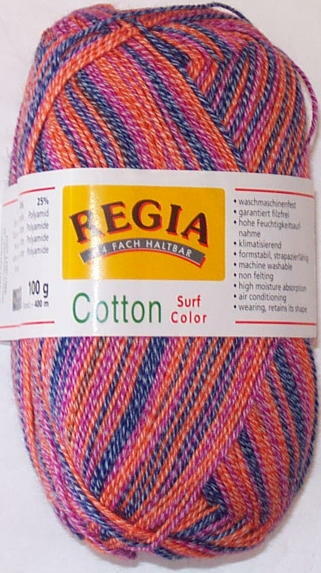 3.5-oz (100-gram) balls of Regia Cotton Surf sock yarn. Each ball contains approximately 437 yards. One ball is enough to make one average pair of socks. This yarn is machine washable, non felting, and has high moisture absorption. Made in Italy. 41% Superwash New Wool, 34% Cotton, 25% Nylon. 30 stitches= 4" on US size 2-3 knitting needles.